Individual pretreating without compromising quality. 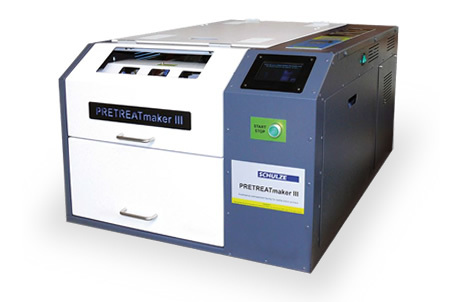 The SCHULZE PRETREATmaker III has a redesigned electronics module ensuring improved performance and easier operation. The new, larger touchscreen allows easy setup of the spray length, width and amount of pretreatment. The machine also comes equipped with four valves, which can each be controlled individually. This not only allows you to setup your individual pretreatment area but also saves a lot of pretreatment liquid. Due to the 5 L tanks high volumes of production can be achieved. The length of the spraying area can be regulated in 2 cm increments using the touchscreen. There are 10 levels available for controlling the amount of pretreatment liquid applied. Another great feature of the device is the automated cleaning process of the four spraying nozzles (consumption ca. 12 ml / hour). This will prevent the nozzles from getting dry or blocked when the machine is switched off. All of these settings, you can store in 5 different editable program buttons. The total spraying time is 4.5 s (1 pass) or 8 s (2 pass).